Greetings again from the darkness. 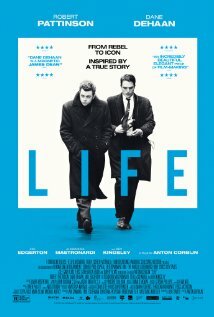 The film’s title has multiple meanings: “Life” Magazine as the source for the famous photographs we have seen so many times; the crossroads in “Life” of both rising star James Dean and photographer Dennis Stock; and a philosophical look at “Life” – how quickly things can change, and how we should appreciate the moments. Director Anton Corbijn (A Most Wanted Man, The American) and screenwriter Luke Davies offer up a snapshot of 1955 as the not-quite-yet-famous James Dean (Dane DeHaan) traveled cross-country with photographer Dennis Stock (Robert Pattinson) from Los Angeles to New York to Indiana. Each man was searching for their true self as Stock’s professional ambition and personal stress are palpable, while 24 year old Dean’s ambivalence about his pending superstardom borders on self-destructive. DeHaan and Pattinson both underplay their roles, and it’s certainly more than a little confusing to see Pattinson in a movie about James Dean where he is not the actor playing the icon. DeHaan captures the low key, soft-spoken side of Dean but only teases at the “rebel” studio head Jack Warner (Sir Ben Kingsley) wanted so badly to control. We get a feel for Dean’s vision of challenging roles in quality productions … a commitment to the art of acting he no doubt sharpened in his time with acting guru Lee Strasberg. The story leans more heavily to the tale of photographer Stock, which is unfortunate, because he is significantly more awkward than interesting. Pattinson plays him as a social misfit who broods nearly as much as the “moody” young actor he is stalking through the streets. The period look is well appointed, and we are privy to some of the moments of Dean’s life just prior to the release of East of Eden and his being cast in Rebel Without a Cause. His relationship with Pier Angelli (Alessandra Mastronardi), friendship with Eartha Kitt (Kelly McCreary), and his bond to the family and farm of his childhood in Indiana are all captured. In fact, it’s the clumsy relationship with Stock that comes across as the least realistic portion … though it may very well have happened this way. Even the manner in which the famous photographs were taken is underplayed … although it makes for a terrific tie-in with the closing credits where the real Stock/Life Magazine photographs are displayed. It’s now been 60 years that James Dean has exemplified Hollywood “cool”, a label that can never be removed due to his tragic death in 1955 after making only three films. Capturing the essence of what made Dean cool is unnecessary because it’s present in every scene of those three films, as well as the photographs taken by Dennis Stock. That’s all the legacy either man needs. Greetings again from the darkness. I certainly consider myself a fan of Woody Allen‘s films and am in awe of his prolific ability to write and direct a new movie most every year since 1969. With so many films to his credit, it’s expected that a few will be clunkers. After a pretty nice run of non-New York based films, his love letter to Rome falls short … not from lack of ambition, but rather from a feeling that these stories have been on his “to do” list for too many years. They feel mostly stale and dated. With one of the world’s most beautiful and interesting cities as a backdrop, Mr. Allen delivers four stories – none of which intersect with the others. There are some similar shared themes, but mostly what the four stories have in common is mass overacting by all involved. Surprisingly, the one exception might be Alec Baldwin, whose wise-cracking lines are played pretty close to the vest. Unfortunately, all of the other key actors seem to think they are onstage at a dinner theatre and that hyper-activity and bellowing one’s lines are required. In one story, Woody Allen (his first acting gig since Scoop) and Judy Davis head to Rome to meet their daughter’s (Alison Pill) fiancé (Flavio Parenti). Allen overhears the mortician father singing in the shower and works out a scheme to get him an audition that could lead to a career. The father is played by famed Opera tenor Fabio Armiliato and this story is so goofy, it could easily fit into Allen’s “early funny ones”. Another story has newlyweds played by Alessandro Tiberi and Alessandro Mastronardi in a series of innocent happenstance that leads to some not so innocent events that include her favorite actor (Antonio Albanes) and high-priced call girl (Penelope Cruz). Most of this has the feel of a Benny Hill skit. Jesse Eisenberg and his girlfriend Greta Gerwig share time with her visiting friend played by Ellen Page. This is the Alec Baldwin sequence, and he is a near-ghost-like entity who pops in to provide obvious advice or warning to the players so they don’t make the same mistakes he made as a younger man. This sequence had potential, but never amounted to much. The fourth story is just an absurd commentary on reality TV and instant fame. Roberto Begnini plays a normal Italian citizen and family man who one day gets thrust into the world of celebrity for no apparent reason. See, that’s the joke. Probably ten years past the time when this was relevant. Bashing Woody Allen is not my intent here. Simply pointing out that there are four stories and numerous actors and none of it struck a chord with me. Not to say there weren’t a few well written lines and a couple of terrific shots of Rome … just not enough to keep me going for two hours. SEE THIS MOVIE IF: you need your annual Woody Allen fix, even if it’s not up to the level of last year’s Midnight in Paris OR you just want to see Penelope Cruz in a red dress that’s probably two sizes too small for her. SKIP THIS MOVIE IF: catching a few glimpses of the amazing sites in Rome is not enough reason for you to sit through some of Woody Allen’s worst written dialogue in years.